Υποβλήθηκε από seo στις 15.04.2019 - 03:03. At Wall Street Oasis, we’ve noticed that every time we focus on improving our page speed, Google sends us more organic traffic. In 2018, our company's website reached over 80 percent of our traffic from organic search. That’s 24.5 million visits. Needless to say, we are very tuned in to how we can continue to improve our user experience and keep Google happy. We thought this article would be a great way to highlight the specific steps we take to keep our page speed lightning fast and organic traffic healthy. While this article is somewhat technical (page speed is an important and complex subject) we hope it provides website owners and developers with a framework on how to try and improve their page speed. Quick technical background: Our website is built on top of the Drupal CMS and we are running on a server with a LAMP stack (plus Varnish and memcache). If you are not using MySQL, however, the steps and principles in this article are still relevant for other databases or a reverse proxy. This is an important first step. For Wall Street Oasis (WSO), we use a reverse proxy called Varnish. It is by far the most critical and fastest layer of cache and serves the majority of the anonymous traffic (visitors logged out). Varnish caches the whole page in memory, so returning it to the visitor is lightning fast. If you have a large database of content (specifically in the 10,000+ URL range) that doesn’t change very frequently, to drive the hit-rate higher on the Varnish caching layer, you can extend the time to live (TTL basically means how long before you flush the object out of the cache). For WSO, we went all the way up to two weeks (since we were over 300,000 discussions). At any given time, only a few thousand of those forum URLs are active, so it makes sense to heavily cache the other pages. The downside to this is that when you make any sitewide, template or design changes, you have to wait two weeks for it to arrive across all URLs. In order to keep our cache “warm," we have a specific process that hits all the URLs in our sitemap. This increases the likelihood of a page being in the cache when a user or Google bot visits those same pages (i.e. our hit rate improves). It also keeps Varnish full of more objects, ready to be accessed quickly. 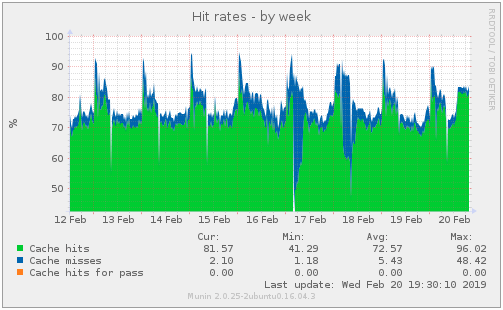 As you can see from the chart below, the ratio of “cache hits” (green) to total hits (blue+green) is over 93 percent. On WSO, we use a MySQL database. Make sure you enable the slow queries report and check it at least every quarter. Check the slowest queries using EXPLAIN. Add indexes where needed and rewrite queries that can be optimized. The following steps are to help speed up your frontend application. The front-end is the part of a website or application that the user directly interacts with. For example, this includes fonts, drop-down menus, buttons, transitions, sliders, forms, etc. Use WebP for images when possible (Cloudflare, a CDN, does this for you automatically — I’ll touch more on Cloudflare below). It's an image formatting that uses both Lossy compression and lossless compression. Use lazy load to avoid/delay downloading images that are further down the page and not on the visible part of the screen. You want to make sure your CSS is inline. Online tools like this one can help you find the critical CSS to be inlined and will solve the render blocking. Bonus: you'll keep the cache benefit of having separate files. Make sure to minify your CSS files (we use AdVagg since we are on the Drupal CMS, but there are many options for this depending on your site). Try using less CSS. For instance, if you have certain CSS classes that are only used on your homepage, don't include them on other pages. Always combine the CSS files but use multiple bundles. You can read more about this step here. If you’d like more info on how to optimize your CSS, check out Patrick Sexton’s interesting post. Use inline svg for icon fonts (like font awesome). This way you'll reduce the critical chain path and will avoid empty content when the page is first loaded. Use fontello to generate the font files. This way, you can include only the glyphs you actually use which leads to smaller files and faster page speed. If you are going to use web fonts, check if you need all the glyphs defined in the font file. If you don’t need Japanese or Arabic characters, for example, see if there is a version with only the characters you need. Use Unicode range to select the glyphs you need. Use woff2 when possible as it is already compressed. This article is a great resource on web font optimization. After reducing our font files from 131kb to 41kb and removing one external resource (useproof), the fully loaded time on our test page dropped all the way from 5.1 to 2.8 seconds. That’s a 44 percent improvement and is sure to make Google smile (see below). Here’s the 44 percent improvement. When possible, move external resources to your server so you can control expire headers (this will instruct the browsers to cache the resource for longer). For example, we moved our Facebook Pixel to our server and cached it for 14 days. This means you’ll be responsible to check updates from time to time, but it can improve your page speed score. What’s a CDN? Click here to learn more. No browsers currently support HTTP/2 over an unencrypted connection. For practical purposes, this means that your website must be served over HTTPS to take advantage of HTTP/2. Cloudflare has a free and easy way to enable HTTPS. Check it out here. Choose Enable+0RTT – More about this topic here. Service workers give the site owner and developers some interesting options (like push notifications), but in terms of performance, we’re most excited about how these workers can help us build a smarter caching system. To learn how to to get service workers up and running on your site, visit this page. Google Page Speed Insights was updated on November 2018 (Details here). It gives you an incredible number of suggestions on how to improve the page performance for mobile and desktop based on Light House. We know there is a lot to digest and a lot of resources linked above, but if you are tight on time, you can just start with Step 1 from both the Backend and Front-End sections. These 2 steps alone can make a major difference on their own. Good luck and let me know if you have any questions in the comments. I’ll make sure João Guilherme, my Head of Technology, is on to answer any questions for the community at least once a day for the first week this is published.